Brightman Clarke Architects were appointed by a family having recently purchased a plot of land on which they wanted to build a new contemporary home. The site contained a rundown timber panelled bungalow on the northern half of the plot. We held initial discussions with the planning authority and it became clear that whilst the site is not situated in the greenbelt, it was classed as being in open countryside and the permissible development would be limited to a marginal perceived volume increase against that of the existing bungalow and associated buildings. This gave us our most interesting and important parameter, we had to design a large four bedroom house on the site of an existing bungalow and in the process make sure that it did not appear to be significantly larger than the existing buildings. To reduce the impact of the proposal on the surrounding context, the concept was to lower the dwelling into the ground and use a considered selection of materials and architectural detailing to form a series of buildings, linked with a lightweight glass atrium. 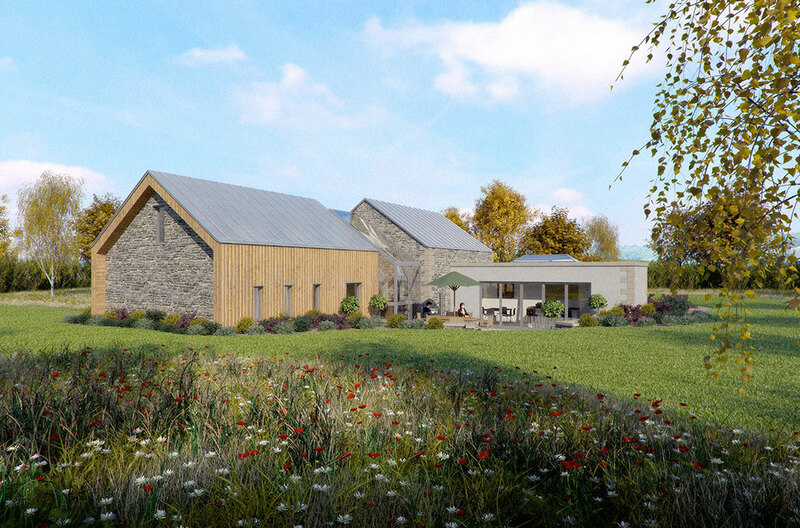 These buildings have then been finished in a variety of materials from locally sourced stone to timber cladding to replicate the forma and style of a series of agricultural buildings. This helps to reduce the perceived mass of the new home and position it naturally within an open countryside setting. Working within this concept, we have introduced modern features such as a stunning glazed link, picture windows and bi-folding doors out on to the secluded rear patio area which is also set below the main ground level to provide a degree of privacy on this open country plot.